Is the iPhone XS a big upgrade from the standard iPhone 8? Is it worth the upgrade? Best Answer: You'd have to understand the facts and differences between the phones, then only you can decide. It really depends on if you want to spend the money on the XS or Not, and what you'd consider an upgrade. I feel I'm qualified to give a little bit of insight because I have the iPhone 8 Plus and I had the iPhone X. Sadly I gave up the X because the screen was hurting my eyes, and it turns out the iPhone X was hurting other people's eyes too because the refresh rates would jump around. 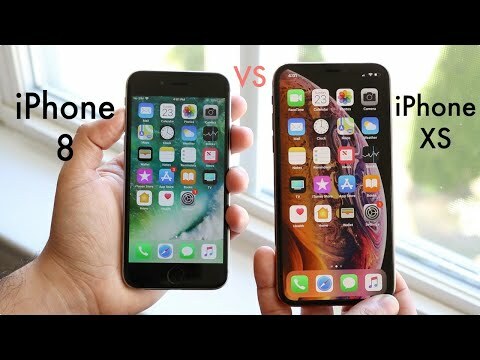 So this is something you might want to think about since the older X and XS use the same screen. This effects some people but not others. Apple does claim that the touch response is better with the iPhone XS and they claim the HDR capabilities are also better. The one feature I miss with the X is the facial recognition. Otherwise I didn't miss the higher screen resolution or any of the camera or playback features. The CPU in the XS is NOT a huge upgrade because it's only 10%-15% faster than the CPU in the previous iPhone 8/X Generation. The GPU is considerably faster in the iPhone XS which would be useful if you're into playing mobile games. However the larger screen resolution of the XS will offset the performance, because it takes more GPU processing power to drive a higher resolution display. The battery on the XS has been downgraded from the X, for whatever reason. However, the battery life endurance rating is still better with the iPhone XS than it is with the iPhone 8. I believe Video capture footage records at 30fps on your iPhone 8, while the XS records at 60fps. So the video capture on the XS will be better. I'm not sure why Apple decided to charge an extra $150 for the iphone XS when compared to the iPhone X. I don't really see how that's worth it. Yes, there are a few more tweaks but that should be expected with a generational jump. In the end, you'll get a little bit better battery life, the screen will look nicer, the screen will be bigger, and the touch response will be better. You'll get facial recognition and Mobile Games will look better and play better. You won't really notice any functionality differences at all. If you're just using the phone to chat with people and check facebook then the features really aren't going to be for you. Sometimes smaller phones have their advantages. I have a Nokia flip phone it works great and isn't bugged by Robert Muller. Hope this helps! No, the iPhone 8 is already $600. The iPhone XS is on sale right now at only $700, along with the iPhone XR at only $500. But the XS' original price is $1200, so it is really not worth upgrading. Why don't you watch a YouTube review and find out? Should I upgrade it in jr opinion anonymous ? The site policy says I can exchange within no refunds BUT 6 days even with the contract. Should I upgrade it? What cell phone service company is the least invasive ik at&t and verizon are two of the worst? How do I unbloke ads? I’m trying to do correct the Voicemail number on my iPhone 6 plus? When you buy a MONQ does it come with one of those little case things?